What Does the "D" in "D-Day" Stand For? What Does the “D” in “D-Day” Stand For? Tom C. asks: The V in V-Day was for Victory right? So what does the D in D-Day stand for? The Battle of Normandy, also known as D-Day, started on June 6, 1944 and was the beginning of the major invasion of German-occupied Western Europe during World War II. But why was it called “D-Day”? You might at first be inclined to think the abbreviation is similar to V-Day (Victory Day). Indeed, one commonly touted explanation given for the meaning of the “D” in D-Day is that it stands for “designated day.” Others claim it stands for “decision day”, “debarkation”, or even “deliverance day.” Even General Dwight Eisenhower, or at the least his assistant, weighed in when Eisenhower received a letter asking for an explanation of the meaning of D-Day. His executive assistant wrote back stating D-Day was a shortened version of “departed day”. Given Eisenhower helped plan it, that should mean cased closed right? It turns out, most historians think not. And, indeed, the evidence at hand doesn’t seem to support Eisenhower’s (or perhaps just his assistant’s) claim. In that context, and with numerous combat operations that followed over the years, D-day referred to the “day” on which a combat attack would occur with H-hour likewise referring to the “hour” when an attack is scheduled to happen. Thus, the “D” is just a placeholder or variable for the actual date, and probably originally was meant to stand for “date” or “day” (if anything), if the associated “H-hour” is any indication. 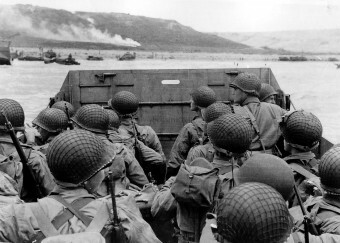 The use of D-day allows military personnel to easily plan for a combat mission ahead of time without knowing the exact date that it will occur. Given that planning for the most famous of all D-day’s in June of 1944 started way back in 1943, and that, due to factors like optimal tides, only a few days in a given month were suitable for the launch of the invasion, trying to fix a firm date in the planning process was pointless, even close to the time of the attack. (In fact, the original set date was June 5, but bad weather at the last minute forced a day delay.) By simply assigning the attack to occur on “D-day”, it solved this issue, and had the side benefit of keeping the date of the attack a secret as long as possible, just one of the many methods of deception the military employed to try to confuse the German brass with regards to the pending invasion. As for handling the pre-D-day preparations and the plan for after, adding a plus or minus sign and a number after the “D” was used. For example, D-1 would indicate the day before the operation occurring while D+3 would mean three days after the operation. In this way, the plans could be easily overlaid onto a calendar when the military leadership decided on the day of the attack. If the day needed to be switched at the last minute, it was then also easy enough to calibrate the plan to the new date. As alluded to, the D-Day that occurred on June 6, 1944 was not the only D-day during World War II and it certainly was not the last, as this method of planning for military operations continues to this day. Of course, because the D-day at the Battle of Normandy was, and continues to be, the most famous of all given that designation, it seems unlikely in the foreseeable future that it will be usurped in people’s minds when someone mentions “D-Day”, despite the military continuing to occasionally use this designation. Two V-Days occurred during World War II, VE Day and VJ Day. VE Day stands for Victory in Europe Day which occurred on May 8, 1945 when the German Army offered a complete and unconditional surrender to the Allied Forces. However, the German surrender only ended war in Europe; the Allies continued to battle the Japanese in the Pacific until VJ Day at the end of the summer. That said, VJ day really wasn’t a single day. Two days in August and one day in September often receive that distinction. August 14th and August 15th are referred to as VJ Day because the Allies announced Japan’s surrender on August 14th, 1945. However, it wasn’t until September 2nd that Japan’s formal surrender occurred aboard the U.S.S. Missouri in Tokyo Bay, which is why that day is also commonly called VJ Day. The oldest soldier to storm the beaches at Normandy in the first wave of troops was Theodore Roosevelt, Jr., the fifty-six year old son of U.S. President Teddy Roosevelt. Roosevelt also happened to be the only general in the first wave and the only soldier to serve with his son at Normandy. The Land Craft Vehicle Personnel Ships used during D-Day to land soldiers on the beaches were originally designed for use in Louisiana swamps where the flat bottom of the boat prevented it from getting caught in shallow waters. Designed by lumber businessman and former Nebraska National Guard Infantry Officer Andrew Higgins, the shallow boat went for several years without attracting much attention from the U.S. government until World War II. Higgins’s company ultimately produced over 20,000 of the boats for the United States during the war. What does the “D” in D-Day mean? 70th anniversary of D-day: What does the ‘D’ stand for? What does the “D” in D-Day stand for? I recently tried a case in Guam and visited the World War II museum there. They had a plaque (I have the picture but it won’t let me post it) proclaiming that every invasion day had a different letter assigned to it, the most famous eventually being “D”. Most reading contradicts this conclusion but this statement is posted at a National Musuem! Departure Day. I have letter from President Eisenhower with this answer. In ‘Diary of a Young girl’ – Anne Frank mentions D-Day to stand for ‘The’ Day ! I always thought it stood for “Doom’s Day” considering it originated during the time of war! I like to think that D-Day stands for Deliverance day. I know that it is not. I do believe that Battlefield Commander Montgomery (Monty) would have appreciated it.